Magnolia Manor Park is located in the Magnolia neighborhood of Seattle, with entrances at 3500 28th Ave. W.
By clicking on “Directions” in the info bubble on the image, you can create directions to the park. The Park property is actually part of a larger site owned by Seattle Public Utilities (SPU), which operates a lidded reservoir there. The circular lid of the reservoir can be seen plainly in the map above, if you zoom in. The total site is approximately just over 4 acres in size, with the Park covering about an acre of it. (1 acre = approximately 43,500 square feet). The Department of Parks and Recreation manages and maintains the Magnolia Manor Park portion of the site under an agreement with SPU. The remaining portion of the site, containing the lidded reservoir, is not open to the public and is protected with chain link fencing. (This photo is item #40462… to see 25 more, go here and enter”reservoir” in the “Search Terms” field, select “Magnolia” from the “Neighborhood District” field, and then click on “Submit Query”). 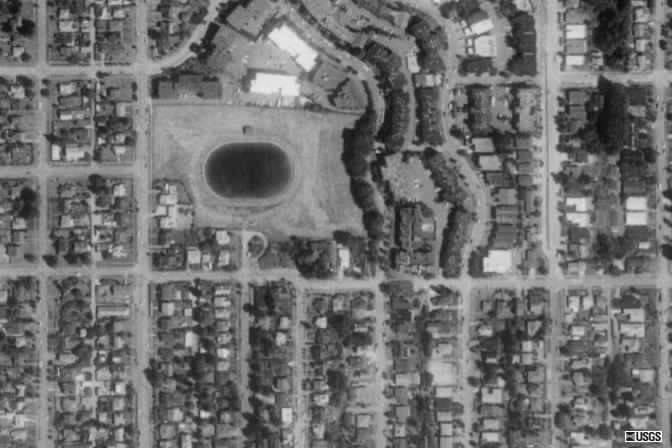 A new underground lidded reservoir was constructed between 1993 and 1995, as part of SPU’s Reservoir Covering Program. At that time, through negotiations with the community, the Department of Parks and Recreation, SPU agreed to open up the Northwest section as a “passive park”. The remaining area was fenced off. (See links to Seattle Times articles reporting on those negotiations and decision: 2/1993, 11/1993, 6/1995). In 2006, the Department of Parks and Recreation conducted a public process to identify potential Dog Off-Leash Areas (OLAs) in Queen Anne and Magnolia. A site located in Magnolia Manor Park was approved as a potential OLA site, pending approval from property owner SPU. In the 2008 Parks and Green Spaces levy, $70,000 in funding was allocated for an OLA in Magnolia. 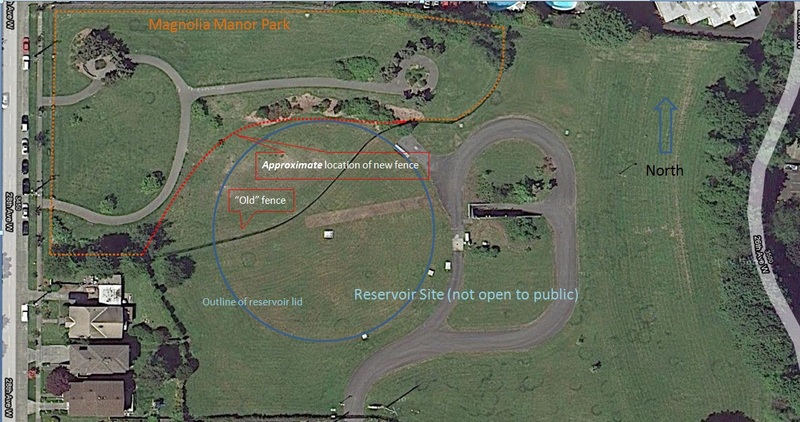 In July, 2010, SPU relocated one of its fences so that reservoir would be completely behind chain link fencing, to better protect it; previously, it was possible for Park users to traverse on a grassy area that was actually above the lidded reservoir. Unlike newer lidded reservoirs, this one was not designed and built in a such a way that could accommodate secondary uses on top of it, and SPU felt that heavy usage in that area posed a risk to the safety of the water supply. This change resulted in a reduction in the size of the Park (by about 8,000-10,000 square feet). Now, 14 years after it was created, Magnolia Manor Park is finally making a comprehensive site plan.